Existing contract management systems suffer from two major problems — they have a very high price point, and their design is based on legacy systems that are decades-old. 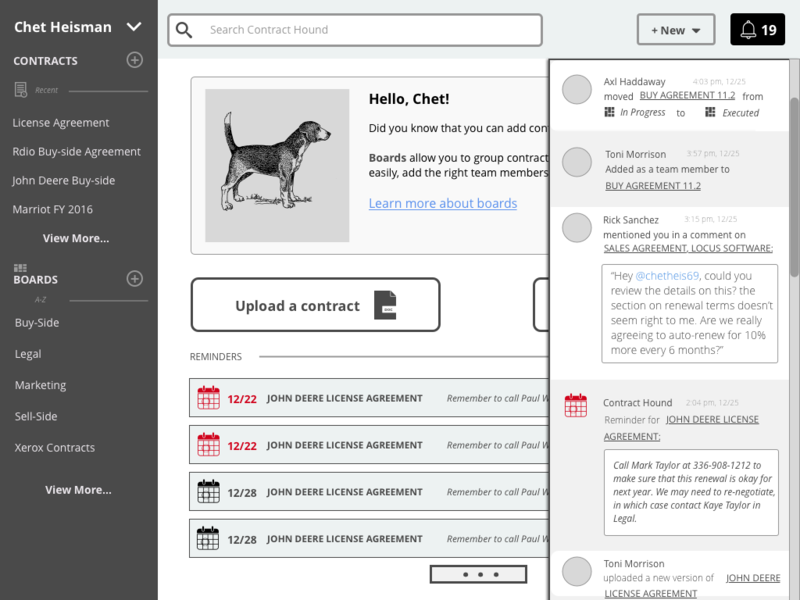 Contract Hound was created with the goal of a leaner, more user-friendly system — one targeted at small to mid-sized tech companies. 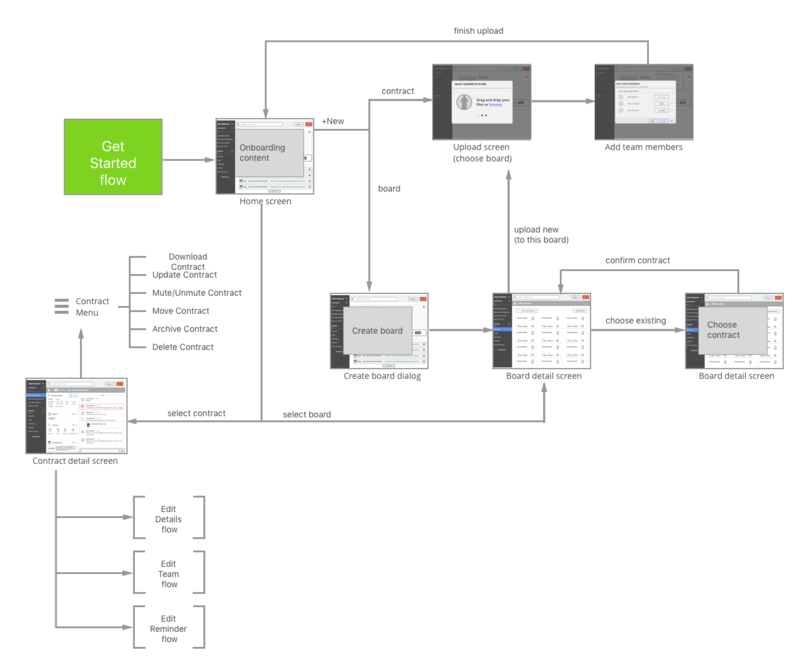 We wanted all the core features of an enterprise CMS, but one packaged with an interface that was simple and… fun? 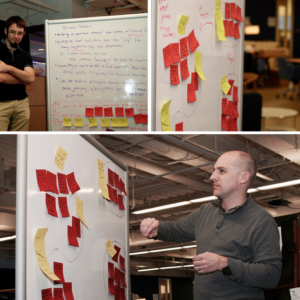 With the Contract Hound team, we workshopped out the main problems with existing CMS software, as well as the core features that were necessary to meet the needs of our customers. We sketched a rough outline of what a new CMS might look like, which features were interesting but out of scope for version 1.0, and began work. We started with a competitive analysis of existing products to see how they were solving these problems, and to identify vulnerabilities in the market. The main usability issue we noticed among competitors was incredibly bulky interfaces, filled with pages and pages of dense fields. We knew people wanted to be able to capture the necessary information about each contract, but we knew there had to be a better way. 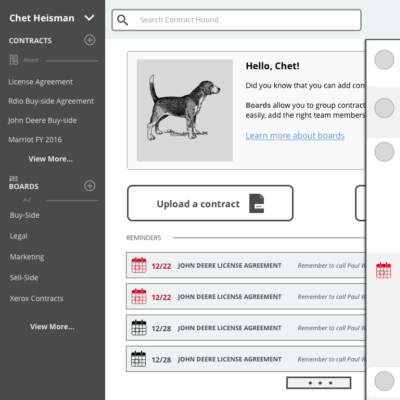 We settled on a simple organizational system of “contracts” being pinned to “boards” so that users could be in charge of their files. 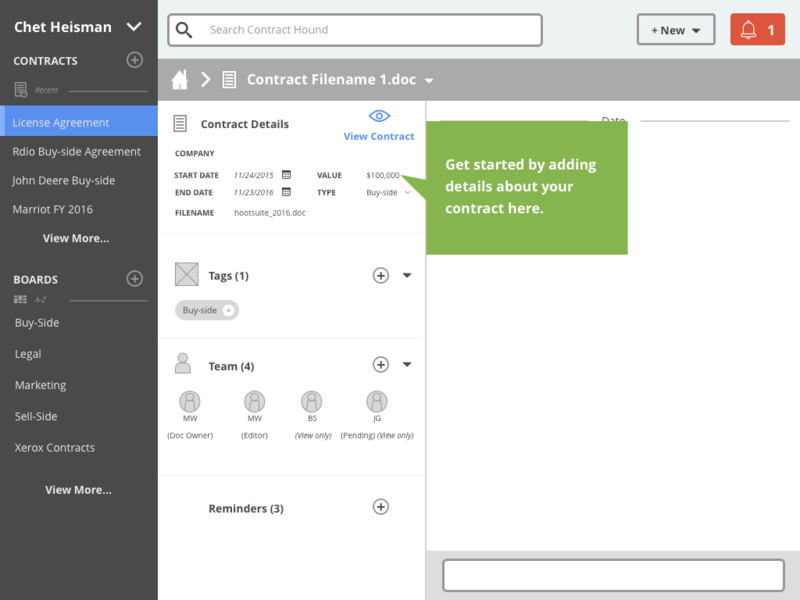 A robust search feature would help users find particular contracts, and a reminder timeline on the home screen would make sure no deadlines were missed. 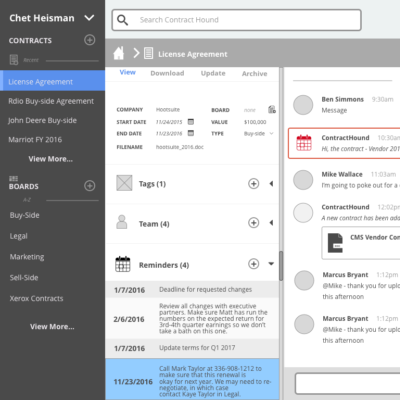 One key use case was keeping people up-to-date on contracts when the existing contract manager left the company. 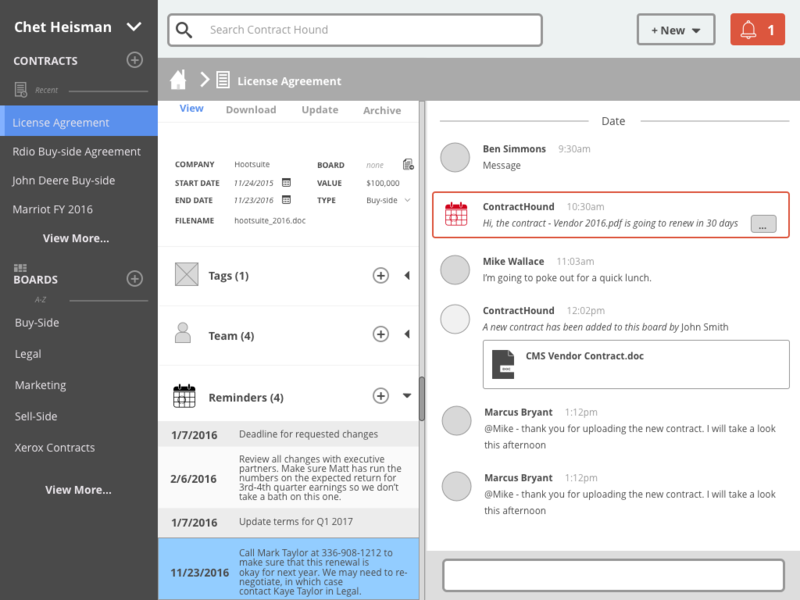 We created contract-level activity feeds to store any comments, reminders, or other information about that contract. 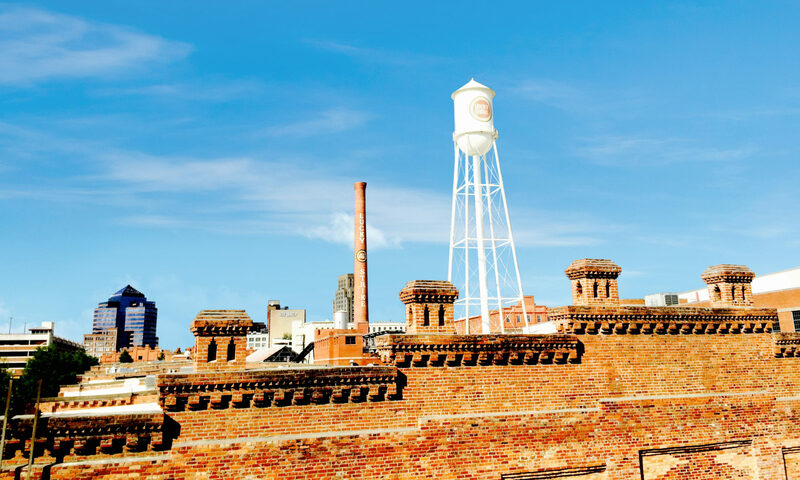 That way, anyone could view the contract and be apprised of all relevant information, instead of having to chase down important details spread over email or other outside channels. This choice also slimmed down the interface as we could reserve dedicated fields for only the most essential information. We still had an issue with getting enough information into the system so that our search and other features would be useful. 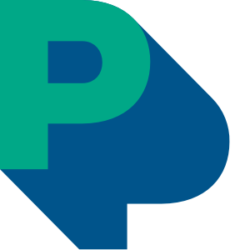 Our initial idea had been to parse the contracts automatically and update key fields with that information, but we quickly encountered a problem: Technical constraints barred us from being able to reliably read the contracts uploaded to the system. That meant we had to rely on users entering the right data, which made the upload workflow too cumbersome. As the rest of the design matured, we hit on our solution — crowdsourcing. We simplified the upload flow to capture the absolute minimum information (title and team members), then pushed to the details page for the rest of the data entry. 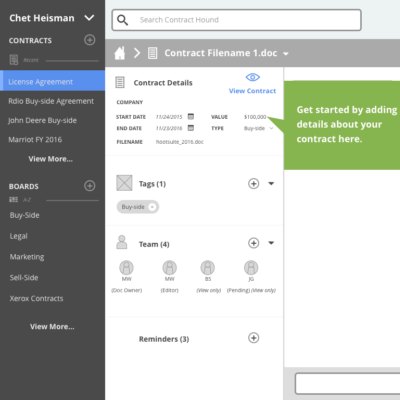 For a single contract, users can enter details in the context they are used to, and for bulk uploads, a user can get any number of contracts into the system quickly, then build out the details with the help of their team. This also gives Contract Hound a way to upsell their services by handling data entry for customers who do not want to do it internally. 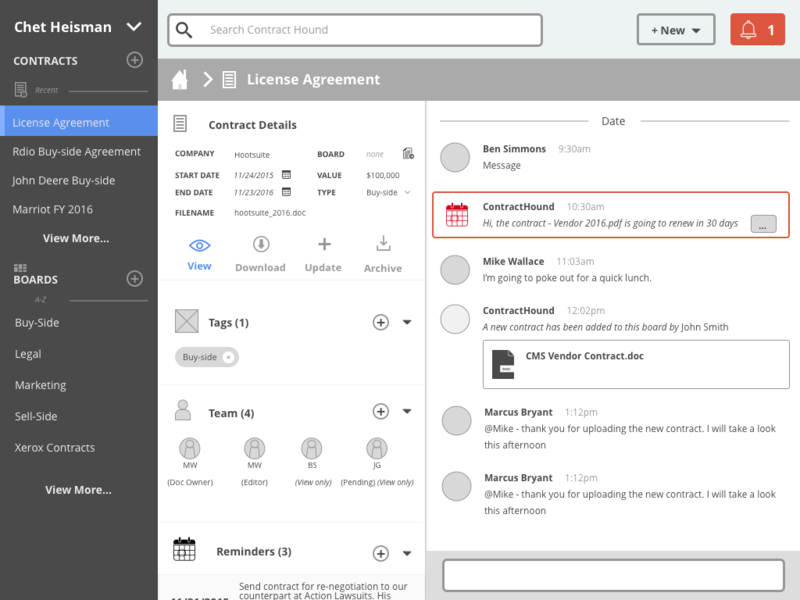 We adjusted the contract screen to make the details pane more prominent, and included reminders within that panel. 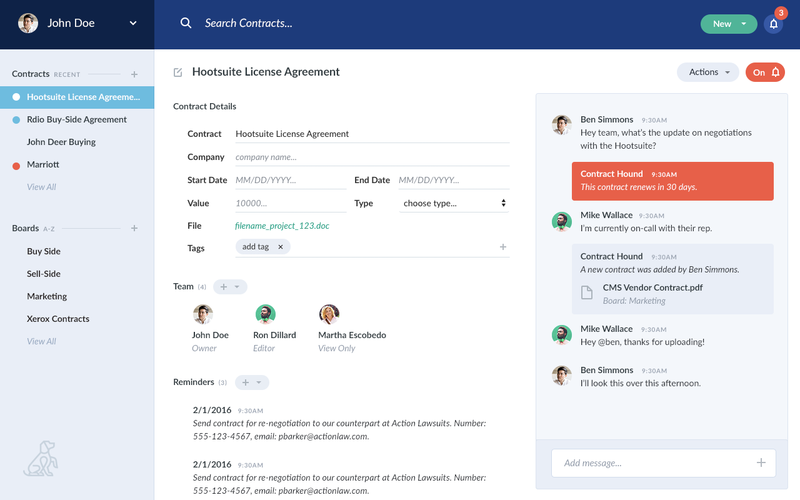 We conducted user interviews and learned that people usually engaged with their contract management system to find a specific contract (often the previous one that had been open), so we simplified the left navigation to focus on those use cases. We made reminders a sub-type of more general “notifications” and pulled a timeline out to the home page, so users could easily see when others modified their contracts, mentioned them in a comment, or took other meaningful action. In our final iteration, we built user administration and account upgrade screens, added preferences for notifications and other profile customizations, and created administration interactions for suspending or deleting users. 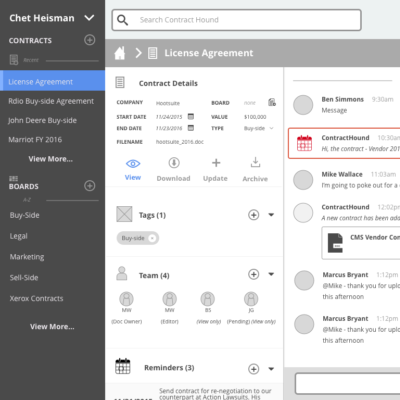 Contract Hound is up and running, generating positive buzz at industry shows for its streamlined UI and seamless user experience. Soon after its initial launch, we went back to the design to add new workflow and permissions features in response to feedback from its initial cohort of customers. View the final product at www.contracthound.com! We can take your product from idea to existence. Get in touch with our designers to address a critical need or to collaborate on a great idea.